Welcome to our 4th episode in our new podcast series that’s all about tax delinquent investment properties and land, and you too can reach financial freedom like we have. We are husband and wife team, Jack and Michelle Bosch. For the past 13 years we’ve been specializing in real estate in a small niche, with very little competition – tax delinquent real estate. Not only is there little competition, but these deals come with HUGE profits because props can be bought for literally, pennies on the dollar. In today’s episode we’re covering all the details about tax liens: what a tax lien is; the actual process of how they work; how you could get the most out of your tax lien investing; some tips and tricks to make the numbers work best for you; why this type of ‘debt’ doesn’t affect your credit report; and so much more. When buying tax liens ask yourself: “Do I want interest?” Or, “Do I want the property? Jack: Wonderful! We are excited to host at our session of the Forever Cash Real Estate Podcast where we make real estate simple because there are so many different ways out there to do real estate investing. And many of them, to be honest, are quite complicated. There, you have to have all this different red tape and things that you have to think of all the time and we have specialized in making real estate work in ways that eliminates a lot of those. So therefore, for your free gift… Just for listening to this podcast, I want to give you a free gift and we want to give you a free gift. You can simply go to www.ForeverCashFreedom.com and download your free mini course on real estate, your free overview on how what we do works. 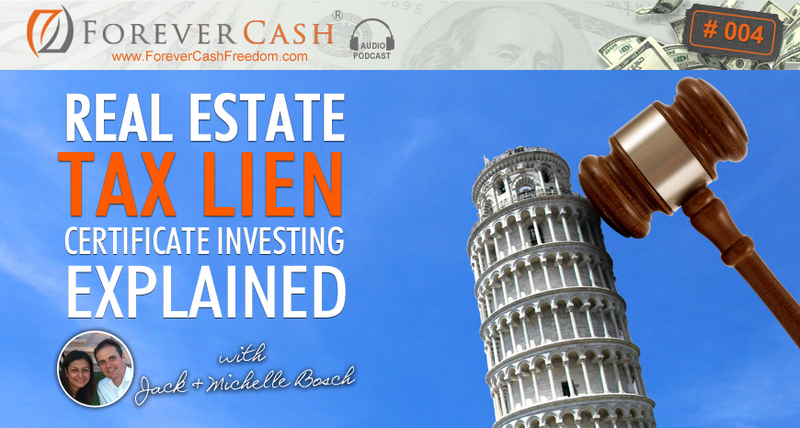 Michelle: For anyone one that has… that is joining us in this podcast for the very first time… So, what Jack and I have done over the last 13 years is we’ve specialized within real estate in a small niche which is tax delinquent real estate. And, our beginnings are in tax lien and tax deed investing. And from there, we really took this and made it our own, and made a big twist on the tax deed and tax lien world because we no longer go to tax auctions. Michelle: Yeah. Tax lien or tax deed auctions, very rarely. However, today in this podcast, we will specifically explain a little bit more of our beginnings in the tax lien world. Jack: Right! Because here’s the thing, our bread and butter are deals where we actually go around the tax sales. We don’t attend to tax sales but we go around them and buy similar properties directly from the owners for literally $0.05 to $0.25 on the dollar. Now, having said that, that doesn’t mean that tax sales do not work. Michelle: There’s amazing opportunities. Yeah! Jack: There’s amazing opportunities in the tax sales world. But, a lot of people do tax sales the wrong way. They attend to tax sales and come armed with a list of properties that they want to bid on. And then, they get outbid on every property that they bid on or worst, they buy a property that they shouldn’t have bought in the first place. So today, what we’re going to focus on in this podcast is we’re going to explain how tax liens work and exactly how you could get the most out of your tax lien investing. Because, just like almost everything in business, you want to not just show up in the auction and bid on something, you want to go about it in a strategic, planned way. You want to actually back track. You want to be clear of what you want to accomplish when you get to that auction or before you even go to the auction. Jack: All right. So, here’s the thing. In the United States and Canada and pretty much around the world, every property that is in existence usually has property taxes. In the United States and Canada, those taxes are actually quite high and in some cases can be thousands of dollars a year versus in other states where it’s almost nothing. In another country, it’s almost nothing. But, in the United States and Canada, where these tax lien and tax deed techniques work the best way, these property taxes are quite a bit. And, they’re actually necessary because the states pay or the counties pay for the services and so on with them. Now, if somebody doesn’t pay their property taxes… Well, there is a process and place that is commonly known as either the tax lien process or the tax deed process. And, basically what it means is that there’s a process, a procedure that allows the government to take away the person’s property for non-payment of property taxes. And, they’re doing that in one of two ways. They’re either doing that by issuing a lien and then foreclosing on that lien, or issuing that lien and then selling that lien to the public, to an investor. Or, by taking the property and putting it up for auction and selling the property at the auction. And, you’ve probably heard somebody talk about in your friendships and your social circle about having gone through a tax deed auction or a tax lien auction. And perhaps, that’s why you’re listening to this podcast right now because you want to know more about it. And, as we said in the beginning, tax liens and tax deeds are very valuable ways to make or to get deals. But, you got to know exactly what you’re doing because they’re in a very high competition environment and there’s also a bunch of junk properties in there and things like that. So, you got to be very careful about how you do that. But, once you know and if you know how to properly do this, you can make a killing in those auctions too. So having said that, in today’s podcast, we’re going to focus on tax liens. Michelle: Okay. So, approximately half of all U.S. states here in the U.S. are tax lien states and obviously the other half are tax deed states. And, most of these states do one auction per year. And at these auctions, liens against the property and not the actual property itself, in the tax lien world at least, are being auctioned. So, each year, millions of liens are being sold all over the country in all kinds of price categories and types of properties, whether it be land, commercial or residential. It doesn’t matter. So, the tax lien process is held early in the delinquency process. So, when a property becomes delinquent already a year after it becomes delinquent, a lien is being sold against it at auction. In the tax deed world, you usually have to wait for two, three, four, five years. It depends on the state. Jack: Until the property comes up for auction. Jack: Now, let me ask you Michelle. Why would anyone go to an auction and buy a lien? Jack: So, you’re basically saying that tax liens have a high interest rate. Michelle: Absolutely! Yeah. And so, they have high interest rates. And not only that, but they are also backed by the government. So, it’s secure. However, the catch is that tax liens are not liquid. Basically, you can only get your money back plus that 16% once the property is redeemed. So, if you need an easy access to your cash, it’s not going to happen. Jack: Right! So as a result, I always say to my students or to our students that when they want to invest in tax liens, it’s like, “Go right ahead!” I mean, if you get to states like Arizona, you get up to 16% interest. In a state like Illinois, you get up to 18% or even 36%. In Florida, 18%. In other states, it’s 8% plus an index amount or an index amount over the stock market is doing plus 8%. So, pretty much almost everywhere, the interest rates on tax liens are over 10%. Now, if you compare that to the bank, it’s absolutely ridiculous. The bank gives you almost nothing. But, as Michelle just said, the main issue here is once you spent the money on a tax lien, you do not get… You get the accrued interest but it doesn’t get paid out on a monthly basis. Instead, you’ll only get your money back plus interest once the person owning the property has paid off their property taxes or sold the property and then the buyers paid off the property taxes. Or, once the property is being foreclosed on by a tax lien by you, in this case… If you’re the tax lien holder, you foreclose on it, and then sell the property. Then, you’ll get your money back plus obviously a big chunk of cash. Michelle: Yeah. So, it’s secured in a way. So, if a person redeems, you get your money plus your 16%. Or, if they don’t pay, you get to foreclose on the property. But basically, the second reason why you would want to invest in tax liens is not outright for the interest, but to go after the actual property two or three years down the road. Jack: Exactly! And, that is actually “ka-ching, ka-ching” the big cash flow or the big lottery win kind of deal because, think about that just in terms of an example. A $100,000 house might have property taxes in the amount of $2,000 a year. If the owner of that house doesn’t pay the property taxes, in a year later, the county issues a tax lien on that property for $2,000 or for $2,200. Then, they’ll bring it up to the auction. You buy that tax lien, and then you buy the next year’s and the next year’s tax liens. Let’s say you’re in for $6,000. Now, you can foreclose on that. You spend another… Let’s say $3,000 on the foreclosure. You now end it for $9,000, and you foreclosed on a house that’s worth $100,000. So, the worst-case scenario is you turn around and sell that thing in a discount for $75,000 and you just made yourself a $66,000 profit. No wonder, tax lien auctions are so popular with the public because the worst-case scenario is you get a 16% interest or 18% or 36% interest. In the best-case scenarios, you can make 6 times, 10 times your money on the deal when you foreclose on the property and sell it. Michelle: Okay. So now, let’s talk a little bit about how the actual tax liens work. So, the county issues a lien against the property for the outstanding property taxes. Then, they sell that lien in a public auction. And, at the auction, when you walk in, one of two things will happen. Either you’re bidding on the interest and usually investors are bidding the interest down, or you’re bidding the amount of back taxes and that amount, that bidding is going up. So, either one of those two is how this works. So, for example, if you have a $100,000 property and let’s say that the annual taxes are $1,000, the county will issue a lien for $1,100 and that includes some fees. So, they’ll put a $1,100 lien at the auction for sale and the interest is going to be anywhere between 8% and 36% interest. It just depends on the state that you’re in. Jack: But, you know ahead of time about the amount of interest in it. Jack: Yes. It’s the same interest every year for a state. It’s actually written in the state statutes. Michelle: Yeah. I was going to say that the revised statutes will contain that, or if you’ll call the tax collector, they’ll tell you. They usually…. Almost every county has at least a fact page on their website where you can basically get all the rules which you want to learn and know exactly what they are before getting into the auction. So then, the bidding goes… Like I said, for interest, it’s going down. And, for example, the first bidder will accept a lien at 18%. That’s where the state starts, at 18%. Then, the second bidder will then bid 17%. And then maybe, the next one says, “Okay, I’m willing to take the lien for just 14%.” And so, this will continue all the way down and it could possibly go all the way to 0% and basically, that’s how it works in the interest rate world. Jack: Now, a quick word on why would anyone accept a property with a zero tax deed or tax lien with a 0% interest? Wasn’t it all about getting a high interest rate? Michelle: Yes. But, if you’re after the property, who cares about the interest rates? Jack: Exactly right! So, right there is the distinguishing factor that I want to highlight right now because this is something that most people don’t understand. They want to go and either bid on these tax liens in the hopes of getting the property and they’re bidding on the wrong kind of property that has almost no chance of actually being redeemed. And so, other people want to just have the property. And… Oh, they don’t want to have the property. They want to have interest. And now, they are faced with something that they’re also perhaps bidding on the wrong kind of property and ending up with a high interest rate on something that will never be redeemed. Jack: So, there’s some thinking about it. Before you go into the auction, you want to first of all determine what is exactly that you want out of it. Do you want the interest rate? Or, do you want the property? But first, let’s talk quickly again about the other way on how tax liens work with the price going up. Michelle: So, with the price going up, the bidding is on the actual amount of property taxes. So, for example, in the same case that where we have a lien for $1,100, the first bidder will offer $1,100 which is the minimum bid. The second bidder will offer $1,120, and then, it will be like, “Okay. Who gives me $1,130?” And, that’s how the price will continue to go all the way up. Jack: At the same time, the interest rate in this case is firm. They’ll all going to get the top interest rate on the amount of the lien, not the amount of what they actually paid for. Jack: So therefore, if they end up paying twice as much for the lien… Well, guess what? They’re now effectively having a much lower interest rate because they’re only making the money on the $1,100 lien, not on the $2,200 that they actually paid. Michelle: So basically, you have to calculate and factor that in as you are bidding that amount out – that your actual interest rate, your actual return on your money will go down. Jack: Exactly. So, for example, when you buy a $1,000 lien that has a 16% interest rate… Therefore, over a course of a year, you would be getting a $160 in interest. Well, if you bid this thing up to $1,160, you have effectively just gotten a 0% interest rate on it because after one year, if they’ll redeem it, you get back exactly what you paid for the thing. And again, the reason for doing that is obviously… If you see a possibility that that property would go all the way down to the tax sale and you end up with that property, in that case, it makes sense. Now again, once you have the lien, you now have a few rights. Now, Michelle mentioned a couple of them already. Number one, the first right is to get a high interest rate. Again, I mentioned that in some states, it’s as low as 8% or 10%. But in most, it’s at least like 14%, 16%, 18%, 24%, up to 36% per year. And, it’s backed by the government and what we mean by that is that, if the owner does not… At least, we’re at number two. All right. Number two, that is… If the owner does not pay the property taxes within a certain time period… This is again different by state. Some states have two years. Some states have five years. Then, you have to wait for that lien while… We’ll just basically sit and wait. But, once the time period is over, your second right comes in, which is the right to actually foreclose on that property. And, once you foreclose on the property, you’re the owner. The formal owner gets nothing and you can now move on and do whatever you want with that property. Jack: …because the 2013 year taxes go delinquent in the beginning of 2014. Then, they have spent the rest of the year basically preparing that auction, and in the beginning of 2015, they’re selling those taxes, the unpaid taxes from 2013. However, the 2014 taxes go delinquent right away in the spring… Let’s say, of 2015. So, in just two to three months after the actual auction happened, the next year’s back taxes are already delinquent. And, in some states, if you own the first year’s back taxes, you are allowed to also go and buy the second year’s back taxes right away from the county before the actual auction happens, and you can do that at the full top interest rate. And, that brings me to another reason why people might want to buy the first tax on the first year for 0% interest. Jack: Because three months later, they have the right to buy the next year’s at 16%. Now, they have a blended rate of 8%. Jack: And, if they buy the next year’s again at 16%, then basically, over the three years’ worth of taxes, they’re collecting 32%. Basically, that means that it’s a blended rate of somewhere around, a little over 10% per year on each of these years. So, that’s a very good interest rate already. Michelle: And, why is that important for the county to give you the first right to buy the next year’s taxes? It’s not only to increase your return based on the blended interest rate but it also gives you the possibility to have no competition to bid for the next year’s worth of taxes. And, it also makes you the sole tax lien holder of that property for two or three years. And, if your state is a state where you can start the foreclosure process after through the years, you know that it’s you and you alone that’s starting that foreclosure process. It’s not just you and then maybe for a year or two, another investor, and then for year three, another investor. But, it’s just you. Jack: Right! You don’t have to fight for these liens in every single auction. Michelle: They get their money back. Jack: They get their money faster. Instead of waiting for yet another auction eight months later, they get their money right away in June. Now, one quick word that I wanted to cover about these tax delinquent properties and about these back taxes that haven’t been paid. I always get the question or we always got the question that was like, “Well, if I don’t pay my property taxes, does that affect my credit?” Or, “If somebody loses their property to a tax deed sale or in our case here in the tax lien world, to a tax lien foreclosure, does it affect their credit? And, the answer is a clear and resounding no. We have to learn that at the beginning too. We didn’t know that and we ask the exact same question. But, the answer is a resounding no. Jack: …for the security on your personal loan. So, on a loan like that, where you take on a mortgage, it’s called an “in personam debt” because the debt is in the person. Personam, person, right? Michelle: It follows the person. Jack: The debt is in the person. It follows the person. You signed up for that debt. But, in property taxes, you never signed that “I owe you.” You never signed the mortgage saying that you owe property taxes. No, the property taxes come with the property. And, if you want to keep that property, you have to pay them. But if you don’t want to keep that property, then you don’t have to pay them anymore. And, the only thing the county can do is take away the property from you or it issue a lien against it and let the lien holder foreclose on it. So therefore, this does not affect the credit of the person who doesn’t pay the property taxes. Now, let’s jump into the steps of how to actually make a tax lien investment work such that it accomplishes exactly what you want. And really, there’s only seven steps to this. So, step number one is you want to get the list of the upcoming tax liens or tax lien properties, right? The properties that are going to come up for the tax lien sale. Number two, you want to filter down that list down to what you want. And now, that’s a key term. We’re going to talk about it in just a second. Number three, you’re going to get… Once you’ve filtered down what you want, you’re going to get every little picture of them and so on, and do a little research. Number four, on the ones that are left over now… They’re usually not that many, perhaps five or ten of them. You want to do a quick title search on these properties. Ideally, you do it yourself or you can ask somebody to do it. But, don’t spend much money on them because… I mean, you don’t have these liens yet and who knows if you’ll actually be able to buy them because you might be outbid on them. And then, number five, you want to drive by that property or send somebody to drop by to look at them. Number six, you want to make your final list of properties. Have your budget ready. Have your cash ready. Register for the auction. And, the last step is basically registering for the auction, attend and bid. All right. So, let’s get started with the first one. First of all, you need to get a list from the county. It’s the easiest step. This county publishes the list three to five weeks prior to the sale in the newspaper. Nowadays, they almost always do it online, and you can either get a copy on paper or in CD. Now, if this is a big county… Like, we live in Phoenix, Arizona – Maricopa County. On every tax lien auction that they have, they often have up to 17,000, 20,000, up to 20,000 different liens that they’re selling at these auctions. Jack: So, this is a big auction. So if you want… If you’re going to get this on paper, you’re going to get like multiple phonebooks. So, I do not recommend you get this on paper. Instead, you want to get it in a form of CD, in an Excel spreadsheet format. Michelle: Some kind of a database. Jack: Some kind of a database that you can sort through it yourself or hire somebody to sort through it to a website like Fiverr.com or so on. So… And, the beautiful part is that most of these lists have the name of the owner, parcel number, how much is owed and they have the situs address. So if they have the address… In some cases, they also tell you what it is – if it’s a residential house, if it’s a land, if it’s a commercial property and so on. But, they do not always do that. So, with that information, you now start looking for what you are looking for, for what you want. Jack: And, “What you want?” is really the key number one question where most people go wrong in this tax lien investing world. The number one question that you need to ask yourself is, “What do you want?” “Do you want interest?” Or, “Do you want the property?” “Are you a financial investor who just wants more money in terms of interest than what you get from the bank?” And, you know that you won’t need that money in the next few years because as we said earlier, you don’t get monthly cash payments from the county or from anyone. You only get your money back plus interest once that lien is redeemed. Meaning, once that it’s paid off. Or, “Do you want the property?” “Do you want to go for properties that have a likelihood of going all the way down to foreclosure that you can foreclose on?” And then, you can move in yourself or flip them and make a killing in the process. There’s two different kinds of people, some only want the cash. They’re conservative people. They’re sick and tired of getting a quarter percent in the bank and they want to get a better return on their money. Or, “Do you want to go after the really good properties that… After the properties have gone through a foreclosure, they can make a $10,000, $20,000, $50,000, $100,000 profit on it. It’s up to you what to decide for. But, depending on what you decide, this will drive what kind of properties you’re looking for. Michelle: Yeah. Because then, you’ll start filtering the list down. And, you basically filter the list, say by the value of property taxes owed or you can start filtering the list by the location of where the property is. You want to weed out properties that are in war zones. Or, you start filtering the list by the type of property. For example, if you don’t want land, then you go ahead and filter those out. Or, you don’t want commercial and you start filtering that out. If your budget is, say $10,000 or $15,000, and then you’re going to want to filter that list based on your budget by amount of back taxes owed. You know, $15,000 and under because that’s the money that you have to spend and invest. Jack: It doesn’t make sense to go after a property with a lien of $25,000 if you only have $15,000 to invest. Or, it doesn’t make sense to go after houses that have the tax liens of $1,200 if you’re only going to the auction with $1,000. Jack: So, you got to go and look for your budget. And, the other thing is… Think about it. If you’re a financial investor, you don’t want to get ownership of the property. Well, let me ask you. What is more likely to be redeemed? Basically, redemption means that the owner comes and pays the back taxes, or the owner sells the property and therefore, the back taxes are being paid. What is more likely to get redeemed? A nice house with a mowed lawn and the picket fence surrounding it and kids playing in the backyard where it’s kind of obvious that the owner just forgot to pay the property taxes, or a house that has broken windows, hole in the roof, weeds that are six feet tall, and is completely abandoned where nobody has looked at that place for the last three years. Michelle: Yeah. It’s basically that the property taxes are not being paid and it’s only because it’s an oversight from the owner. Jack: It’s an oversight where big commercial properties sometimes don’t pay their property taxes more than once every two years because it’s a cash flow game. They rather use their cash for something else. Jack: And, as a matter of fact, we sometimes do that. We have some properties where we pay the property taxes for only every two and a half years because we rather use our cash to do more deals for us to make a 100%, 200%, 300% return of money than paying it on property taxes where we make a 16% where we avoid the 16% interest penalty. Jack: So, that’s something to consider. At the other side, on the flip side of that, if you want to go for properties that will go away down to the foreclosure that you can own, you want to go off to the junky properties. You want to go off to the mobile homes, off to the empty properties, the abandoned properties and after land. So, that’s kind of the key distinction at the very beginning for you to filter out what you want to go after. Michelle: Then, you go and basically continue your research by getting pictures. You pluck the addresses, the site addresses into Google Maps or Google Earth. You get an impression of the properties, where they’re at. Is it the type of neighborhood that you want to invest, regardless of whether you want to get the interest rate or the actual properties? So, based on that, you start narrowing and filtering down that list, and this helps you eliminate what you don’t want, basically. And then, you can proceed to starting with a quick title search. You don’t need to hire a title company for this. That is too expensive. It’s about $50, I think, to search. Jack: $50 to $70 to search. Yeah. Jack: It will cost that quickly. Yeah, absolutely. Jack: And, the reason for that is very simple. The reason for that is if you’re going after the property, you basically want to eliminate all properties where there’s a high likelihood that somebody will redeem those property taxes. Now, let’s talk about that. If you see, there’s a $400,000 property, $3,000 annual property tax, and it has a mortgage. You find out that this thing has a mortgage that was issues two years ago, and therefore, it’s probably a $350,000 mortgage. Do you honestly think that the bank will let that property go all the way to foreclosure? No! The bank is going to… So, if it’s one of these exceptional cases where they allow the owners to pay the property taxes themselves in the first place… Very soon, they will go and they will realize, “Hey, the property taxes haven’t been paid.” And, they will either force the owner to pay it or they will pay it themselves and tag it on to the mortgage. So, if you are out to get the property, you want to stay away from properties with mortgages. Michelle: But, if you are after the interest rate, then you want these properties. Michelle: Because there are the ones that have a high likelihood of getting redeemed. Jack: Exactly right! So again, your basic decision of what you want to go after continuously drives you to completely different types of properties in that selection process. Michelle: Yeah. So then, the next step is to actually drive by or hire someone to drive by the property, if you’re not in that same state. Jack: Right! Because tax lien auctions can be done online nowadays. You don’t have to be physically there. But, you do have to have somebody to physically look at the property because it’s very possible that the pictures are older. Michelle: Yeah. And so, you have them take pictures and have them sent it over to you. In that way, like Jack said, you get to see the property before you bid on it. The aerial pictures might be one to five years old. So, it’s always a good idea to have a warm body to drive by and take a photo. And, you can find people on all these different websites that for $5 or $10 bucks will go and take a picture for you. Jack: Absolutely! For example… Here’s the thing, I have seen… Or, I can even have a realtor go out there. Jack: You can cooperate with a realtor and basically tell them, “If you buy the lien, if you buy the property down the road, they can have the listing and so on.” So, some realtors will do it for you. But, the key reason here is the following. I’ve heard and I’ve seen cases where people bid on properties where they’re all excited about it. So, the aerial pictures show this beautiful house on this acre lot. And then, when they bought the lien and went to look at it, they saw that before the auction happened, like a few months before, it happened to be that in that town, the house was burned down. Michelle: Or, it could be vandalized. Who knows? Jack: Yes! Vandalized, burned down. And now, instead of buying a lien on the pretty house, they bought a lien on something that’s completely vandalized or even worse, burned down. And perhaps, the way it burned down caused some environmental issues and now they’re stuck with something. They’ve invested in something that is actually worthless at the end of the day, or at least, by far, not as much worth as they thought before. This is the same with IRS liens. With IRS liens, they attach themselves to the properties. So, if there’s an IRS lien attached to the property and you buy that lien, it makes it much, much more unlikely that the owner of that property is going to actually redeem that tax lien because, first of all, he doesn’t have the money. He still owes the IRS all of the money. And therefore, if that’s the case now, you can’t even foreclose on that property very well because if you foreclose on it, you also have to first pay off that IRS tax lien, and you certainly don’t want to do that. So, the style of search on those things is actually has to do with making sure that you not only pick the right property for you but also that you avoid the situation that you buy something that is a bad case or is a bad property. And, this is the same with the drive-by. Having a physical person driving by the property serve that exact same purpose that you make sure that you don’t only invest in something that is actually worth than what you thought it’s worth. Jack: And, that is actually not our rules. That is the money rules of the second richest man in the world, Warren Buffet. Jack: Or, if not, at least prioritize them, such that you go for the ones that you want most first. Jack: And, for the ones that you want least, you’re only going to get to them if in case you didn’t get the liens on the ones that you wanted a lot. Michelle: Yeah. So, you make sure that you definitely bid on the one that counts. And, if you don’t get that one, make sure you also have a few back up properties to bid on and up until your $20,000 of allotted budget for tax lien investing. So, you go ahead and then register. Usually, like I said, the county websites will have a fact page. If not, you can either call the county or walk into the county tax collector’s office and find out all the rules. Make sure you research them and that you follow the rules so that you don’t have all those research go to waste because you didn’t register by their deadline or didn’t wire because some counties will require you to actually wire deposit in advance before bidding. So, you want to make sure that you’ve read all that detail and you follow the rules. Jack: Now, let’s discuss how we know that. Michelle: Because we made those mistakes. Jack: We made those mistakes ourselves. Exactly! Jack: I did a lot of research in the property on an auction in California and I had picked out my 20 properties that I wanted. And, I was all ready for the auction and it was Thursday and the auction was on Friday. And, I realized that I had not wired the $2,500 that is required as a deposit to be able to participate at that auction. And, not only did I not have the chance to wire it anymore. But also, the wire was two days past due already. It had to arrive by Tuesday in order to be acknowledged and accepted before that auction. So basically, I have spent a good 30, 40 hours research all these properties and doing exactly what we wanted to do because there’s a huge amount of properties in that auction. And, we narrow it down more and more and did all those things. We spent half a week or more looking and preparing for that auction. And, everything was wasted because I didn’t pay attention to the fine print in the auction details. So, make sure you do that so that you don’t have to learn that lesson. Michelle: Or, it’s online. And then, I think we’ve given away one of the secrets already. And, you walked in there armed with a couple of bidding secrets. And, the first one is, everyone bids on the pretty properties for tax liens. And, those are the properties that are most likely to be redeemed. So, the ones that are actually most likely to go to tax lien foreclosure… If you are a person or an investor that is after the actual property, you want to go and bid on ugly properties. These are most likely to go to actual foreclosure where the investor will be able to buy the tax lien for one, two or three consecutive years and then actually foreclose on the property. As a plus, you’ll have less competition and that means that you’ll have higher interest rates in case it does get redeemed. Jack: Right! Because again, even in the case where you go off to the ugly properties, the properties that nobody has looked at, the abandoned properties, the vandalized properties, and so on, they will still have value and you go and foreclose on them. They are the ones that have a high likelihood to be foreclosed down the road. But, even if you go to those properties, you’re not going to be able to foreclose on all of them. Instead of a 98% of them being redeemed, perhaps it’s only 50% or 60% of them being redeemed. But, when you have focused your investment only on the ones that you think you can get down the road, even on those, you’ll only get perhaps 30%, 40%, 50% off of them and perhaps even 20%. It doesn’t really matter. But, your chances are 10, 20 times higher to get one of those than in the other case. But, the key is, even with those, many will get redeemed. But, because there’s less competition, you get a higher interest rate on those too. So, you went double basically. Michelle: So, what are these properties that have the highest chance to not get redeemed and actually go through the tax foreclosure and where you have the lowest competitions? These properties are usually land, boarded-up houses, houses in rural areas, commercial properties – both in rural and city environments. And so, if you wanted to go down the tax lien foreclosure process, then those are the types of properties where you will experience least competition at the actual auction. Michelle: So, once the auction is done, you’ll be declared the winning bidder and you’ll usually have to pay the remainder of the taxes owed within 24 hours. Jack: If they do the auction on Monday, then they’ll give you usually until the end of the week to send the rest of the funds. But, in that case, they already have your deposit from you which is typically between $2,500 and $4,000 to $5,000. So, it’s not a little deposit. And, if you buy something and you don’t pay the rest by the end of the week, they will keep your deposit and ban you from all future auctions. Jack: So, you really want to make sure that you do your homework. You bid only on properties that you really want and you follow those rules that we just mentioned. Make your decision early and clear about what kind of property you want to go after. Based on that, you either take the ones that have a mortgage or without a mortgage, the ones that looked pretty or the ones that looked ugly, the ones that are land or the ones that are improved, and so on. And, you focus on those based on your desired outcome. You go to the auction. You bid. You pay. And now, you own a tax lien certificate. Michelle: Yeah. And, once you own the tax lien certificate, you really have one thing to do and that is waiting. You will either wait for the waiting period to be over and you can foreclose on that property. Like I said, it depends by state. Some states have two, three, up to five years of waiting period. Or, you can wait for the property owner to redeem and you’ll get your money plus interest back and that’s pretty much it. Jack: Either case is a pretty good scenario compared to what you get for that money in the bank. Jack: So, most people I know run this business such that they go very clear in one or the other direction. They’ll either go for just the interest or they’ll go for just the property. And, when you go for just the property, the interest really doesn’t matter. You pick the ones that are clearly the most likely to go all the way to tax foreclosure. And then, you go for them because the jackpot is in the property. When you have that property and when you buy that property… Perhaps, that early on, you have spent $8,000 or $9,000 on a property that’s worth $100,000. You turn around and sell that thing for $80,000 or $90,000, you just made 10 times your money in an $80,000 profit. On the other hand, if you’re a purely financial investor, you go the exact different route. But now, we say that what most people do is that they actually don’t have even a plan on what they go for. They’ve heard about, “Hey, tax lien auctions sounds good. I can buy at 16% on my money. Great!” So, when they go, they literally, almost like randomly pick some properties out of there. Then, they bid on the auction. They get the lien, and then all of a sudden, at the end of the day, they’re like looking at what they actually bought the lien for. And, they find out that they bought a piece of land that’s like 1,000 feet wide. It’s like 5000 ft.² downtown Atlanta and it’s like, “Great!” Or, downtown Miami which is a tax lien and deed state. So, downtown Miami. Usually, they’re excited. They’ve bought 5000 ft.² in downtown Miami. But, when they looked at it, it turns out to be only 5 feet wide and 1,000 feet long. It’s basically what’s the measuring at. Jack: Or, they bought something that has a big IRS lien on there. Or, they bought something that has a big mortgage on there and in that case, at least they got their money back and so on. Or, when they make any other kind of mistakes that go opposite to what they really wanted to do. With this very simple plan that we just gave you, you can literally go and follow it, and then be prepared for the next tax lien auction and buy only the kinds of liens that you really want. Michelle: And, with that then, we really appreciate you taking the time to listen to this podcast. Jack: …under www.ForeverCash.com/PodcastNotes and look up the notes to this podcast and download them. It’s basically a little summary of what we’ve just talked about. And, if we have any additional documents and things like that that we want to give you with that, you’ll always find them under the podcast notes. So, that’s what I want to just quickly throw in here. And, that leaves only a couple of things to say. Number one, we would love to get your feedback on our podcast. We would love to get your review if you can go to iTunes or perhaps, you can even do it on your phone. But, we know for sure that you can do it on iTunes. Go there and leave us a review of our podcast. The better, the better, of course. We’d love to have a lot of good feedback on our podcasts and if you can do that, it would be greatly appreciated. And lastly, don’t forget that you can have a free gift waiting for you on www.ForeverCashFreedom.com. Thank you very much!